Fortunately for me, being a lover of art and creativity, I’ve had the pleasure of interviewing and working with many talented and inspiring artists. However most recently I connected with a San Francisco based artist who – shall I just say… is truly unlike the rest. We connected after I had begun searching for an artist to help create a piece of art for Summer Sky Creative Agency to be donated to the UCSP Benioff Children’s Hospital. I was looking for something specific, the goal for the project was to create art that would inspire healing and tranquility for the children of the hospital. Although there were many great artists in the city, there was one piece that spoke to me and I went on a mission to find out who the creator was. I soon found out the artist was Lindsey Millikan, a San Francisco local taking the world of art and color by storm. 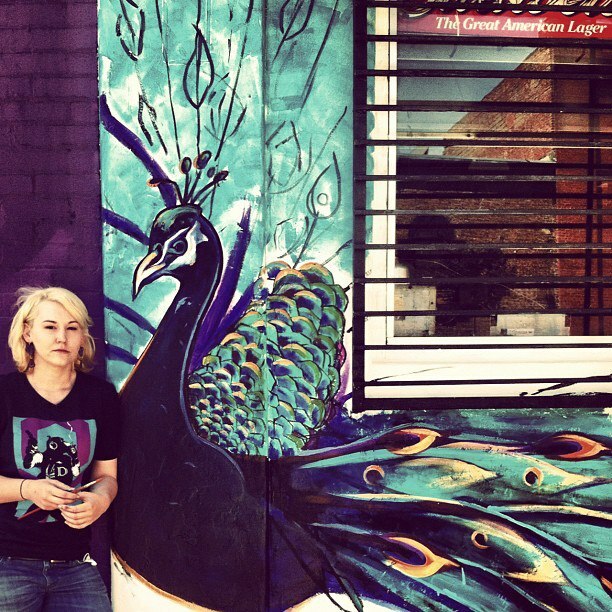 Lindsey’s murals can be seen throughout the city and her use of color to me is, well, astounding. Lindsey was gracious enough to sit down and chat with me about her art, the craziest place she’s painted a mural and how she’s integrating herself into society’s visual landscape. Lindsey, can you tell me a bit about your background and where you’re from? I grew up in Texas, started my undergraduate education in St. Louis, completed it back in Texas and then moved to San Francisco six years ago for my graduate studies. I completed grad school in 2012 and have been working professionally as an artist ever since. I’ve been painting/drawing since I can remember. However it wasn’t until about 8 years ago that I really decided to commit to studying it exclusively. I was actually an avid athlete and biology/pre-med student and EMT once upon a time. Is paint your only medium? I fell in love with oil paint a few years ago and never looked back. But for my mural work, I also work in acrylic and latex and occasionally spray. As an artist, I will sketch in gouache, watercolor and dry media. But for completed works, oil paint is always my focus. Why did you gravitate to art and when did you know you’d make a career out of it? My parents always encouraged me to create since I was a young child. But growing up, I didn’t really ever think I would pursue it for a career. It didn’t ever seem like an actual possibility. But, I could never really let it go. At one point in college I was a triple major. I was studying Studio Art, Digital Process Imaging (Photography) and Biology/Pre-Med while playing NCAA soccer. It was pretty nuts. I realized I couldn’t excel in anything unless I narrowed my focus. So one summer session, I took only studio art classes and devoted to myself completely to spending countless hours in the studio painting and drawing alone with music blasting and obsessively trying to improve my skills. After that, I dropped the other studies even though I was so close to finishing that biology degree (much to my parents’ chagrin). After completing my BFA in Studio Art, I farted around Austin, Texas trying to figure out how to work as an artist. But I had no idea what I was doing. My younger brother was headed to the West Coast to study Industrial Design. My parents were worried about him being out there without any support system. He and I have always been tight, so he and I headed off to San Francisco. He pursued his BFA in Industrial Design while I worked on my MFA in Fine Art Painting. I’ve been here ever since. How do you usually begin working on a new piece? I always am first struck with an idea regarding color, composition and substrate. Subject matter is secondary. I research everything to death. After doing a few thumbnail sketches, I start on the main painting pretty quickly. Did you go to school for your craft? I completed my BFA in Studio Art from Texas State University in 2008 and completed my MFA in Fine Art Painting from the Academy of Art University in 2012. I also studied abroad in Italy for a couple months in a plein air painting program during my graduate studies. 1. Be as prolific as possible. It’s important to always be working and striving to improve your craft. 2. Be self-critical while constantly studying. Know contemporary artists as well as phenomenal artists of the past. 3. Find/create an artist community and support structure. Choosing such a risky career path can be terrifying, isolating and overwhelming. Many of my friends and family cannot relate to my untraditional career path, so it’s really an amazing thing to find other artists that you can look over and see them forging ahead as well. Oof, heavy question and one that cannot be answered in such a limited format. But, I’ll try! An artist can and should have many roles in society. Personally, I strive to create visual art that has a lasting impact by expressing a universal truth through my own individual experience. In this vein, my work encourages people to look outside of themselves, encourages inclusion and connection and hopefully ignites a conversation. When I first began my professional work, I focused a lot on what I was painting and what I was trying to say. In my work today, my focus is primarily on color, color relationships and paint application and the subject is secondary. Where’s the craziest place you’ve ever created a piece of art? I’m pretty torn between my two favorite places to paint. One is my painting studio that I share with Prairie Prince in San Francisco. It’s the old Lukas Glass stained glass studio. The studio is in the Bayview neighborhood and has phenomenal northern light streaming through at all times. In addition, Prairie has his drums set up there along with a great stereo system to jam out to while I work. I frequently lose track of time only to realize day has turned to night and I have forgotten any semblance of a regular meal time. The second, is probably anytime I’ve painted outdoor murals. They are incredibly physically and mentally demanding. Outdoor walls never go as planned and really get me to loosen up and roll with the punches. The surface is never ideal, the weather is always a formidable opponent, and the public can be incredibly distracting. As exhausted mentally and physically as I am after working all day on an outdoor wall, it’s also one of the most gratifying work experiences I’ve ever had. What themes do you pursue when creating a new piece? In the past I’ve explored the ignored and disregarded elements of city life, the ethereal and powerful influence of music on the creative process, and in another series my focus has been on “whereabouts.” I’ve been revisiting and reinterpreting state flags in an exploration of our need for a sense of belonging, inclusion and belonging. Most recently, I’m working on a new botanical series with the woodworker and craftsman, Zach Bruce, from Denim Woodworks. 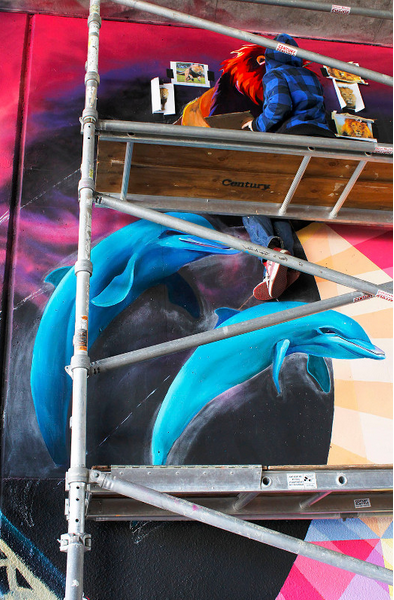 For murals, the work is more about the community needs. I’m usually asked to render animals and figures with high color saturation. What’s your favourite piece of work thus far? That answer probably changes everyday. But today, I just delivered and installed a new piece for new collectors. They happened to walk into a shop in San Francisco that had my work and commissioned a new piece. I combined several elements from a past series, which was an interesting challenge. Ultimately the piece turned out great and is now sitting front and center above their living room fireplace. That’s kind of the dream when you first start out as an artist. That someone stumbles across your work and not only has to have something, but invests in a brand new creation. A couple years ago, I was working with a group of artists for a non-profit in Oakland when we were robbed at gunpoint. They stole a bunch of our videographers equipment. We were painting this huge wall under a highway overpass. The work was really from the community on up. The local school children had done drawings and stories that inspired the lead artist’s design. The entire concept is seeing self as super hero and using art, music and education to rise above poverty and crime. Thus, the irony. After that traumatizing experience, all of the artists took about an hour break to gather ourselves, rallied together … and then we all decided to continue to paint that day. We all felt that crime really just reinforced the importance of the wall. Belonging to a group of working artists, who displayed such a capacity for resilience and determination in extreme circumstances was a beautiful thing. Who are some of the artists that inspired you while coming up in your career? I’ve had a number of teachers who have taught me the craft and skills that I have immense gratitude for. There are three artists that taught me the most as a professional artist. David Burke, has shown me through example how to simultaneously stay rigorously self-critical and continue to strive for excellence in my studio work, while working tirelessly on large-scale mural work as well. Amanda Lynn, who was the first young female artist I met who was making a living in San Francisco being a bit of a renaissance woman, with a solid skill set in everything. Anytime I’m feeling lazy, I remember she’s out there hustling and it gives me the kick in the pants I need to keep on the top of my game. Lastly, Prairie Prince, who I share a studio with has probably influenced my studio practice the most. He is an incredibly valued mentor, confidant, collaborator and friend. Do you think you see the world from an artistic point of view? Haha, I actually never really thought I was thinking so different than anyone else. But I’ve had it pointed out to me by almost everyone I know that I apparently have a very unique view of the world especially when it comes to color. I had a little girl tell me I was her favorite artist because I made her see color in a new way. I’m pretty sure I melted into a puddle on the spot. Are you ever surprised to see where your pieces end up around the world? Ask me that question again in a few years. I promise to have a really good answer for you. You’ve made quite a name for yourself in San Francisco, why do you think your art is so valuable to those who get to enjoy it there? A random stranger in a bar mentioned to my brother how he changed his biking commute in San Francisco, just to go by a specific mural. It turns out it was one I worked on years before. My brother called and asked me to rush over to the bar to have this guy tell me the story again. He teared up telling me how he was struggling to make ends meet in the city and working endless hours to the point of exhaustion. But that on his way to work at 5 am every morning, he’ll go a little out of his way to check that mural out as an inspiring start to his day. That was pretty amazing to hear. I think I am just one of many valuable artistic voices in this city. The people of San Francisco tend to be rather receptive to public art, the trick is finding out how to finance it in order to do more and more legal walls. Speaking of financing, what role does arts funding have in San Francisco? Arts funding for public art and for art education in the public school systems is of the utmost importance. When art programs are cut (like for example in Oakland), students lose access to curriculum that strengthens creative problem solving, allows youth to vent through positive outlets and helps them discover natural talents. Art fosters unity, boosts self-esteem and challenges students to think critically about the visual culture they are submerged in. The same is true for the adults of society with blighted walls and murals in our urban landscape. When people speak out against street art and/or graffiti, I think they should really question why they consider that an affront to their vision of the city, all the while a terribly tacky ad for a terrible product run by a terrible company is completely justified by our societal norms. Advertisers shouldn’t own our visual landscape. Our visual landscape informs our mindset and our actions. Therefore, public art is essential to the common good. My goal as an artist is to ignite conversation and connection amongst viewers. The best way I can do that is by becoming a part of society’s visual landscape whether it’s through my studio practice or my mural work. The studio work is a more personal level of connection. It is where I can continue to push my skill set with academic rigor and explore ideas more intensely. The public/outdoor mural work is where I would like to make huge strides with giving back to my community. I would love to design and implement a series of huge, impactful walls around the world with a team of talented, intelligent and hard-working artists. Special thanks to Summer Sky Creative Agency, AGANA, and WeWork San Francisco.